Very Denniee Nails :): Catching Up on the 52 Week Challenge! Hey guys! Sorry I haven't posted in a while. School and work have gotten really busy lately, and it's approaching finals soon. I've still been polishing my nails and everything, just haven't really had the time to go through and edit pictures. Only 2 more weeks until the quarter's over and then I can do some soul-feeding with nail polish, Assassin's Creed, random DIY crafts, and some self-pampering. And I need to clean the house...but that's another story. Anyways! Onto the nails :) Previously, I was behind on the 52 Week Challenge, but now I am finally up to date :) Since I haven't posted in a while, I just decided to let everyone see what I've done over the last couple weeks all at once. So enjoy! So, for week 7, I decided to do a greyscale scale marble (grey can count as black/white too, right?). I don't do watermarbling very often because it is time-consuming and very messy, but the final product is definitely unique! I painted a white base using 2 coats of Wet N' Wild White Cream in hopes of making the colors of the marbling pop, but I'm kind of sad because the black ended up looking more like brown, and the grey kind of blends into the white. Oh well, I tried. Use filtered, room-temperature water. This ensures that the polish will spread evenly. I usually let the water sit for 30 minutes before I use it. 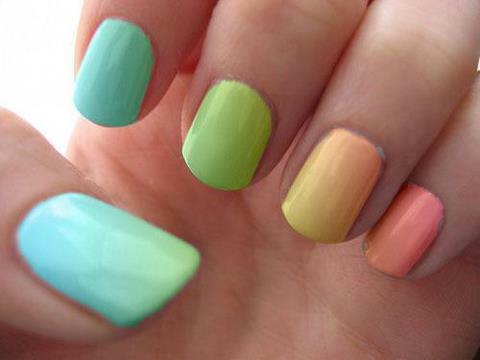 Tape up the area around your nail before beginning. This ensures that you have the least clean-up to do. Don't drop the polish too fast into the water, otherwise it just goes straight to the bottom of the cup. Before dragging your design, drag an edge of the polish and adhere it to your cup. This way, your drops of polish don't go floating all over the place! I hope these tips help you do a successful water-marble! It's not an easy technique, but the results are worth it! For week 8 (and Thanksgiving), I did a saran wrap mani with an orange base and dabbed on a bronze on top. I can't say I really like this color combination, but it gives ordinary orange nails (are orange nails actually that ordinary?) a little bling! I did something similar during week 4, but it didn't really turn out the way I liked it to, so I tried it again. This time, I can say that I got closer to what I had in mind. However, the colors are not saturated enough, which gives it a chalky look (if my boyfriend says its chalky, it must really be chalky). However, I'm pleased with how smooth most of the gradients turned out. Not so pleased with the somewhat bald spots, but they're not that noticeable. For this mani, I painted 1 coat of Wet N' Wild White Cream as a base to attempt to make the colors stand out more. For the pink, I mixed Shelby and the same white cream. I did the same for orange, using Arizona. All the other colors are straight from the bottles. For the gradient, I paint two lines of the colors I want next to each other on a makeup sponge, then dab the sponge on the nail to create the gradient. The only problem I have with this method is pulling off the polish you already have on the nail, but it wasn't so bad this time, luckily. The picture above was the inspiration for my mani. Look how smooth and lovely these colors look together! I stumbled along this picture on my tumblr one day and reblogged it for future reference. However, no credit was given to anyone, so if you know the artist of these nails, please do tell me!